Added by Frotty Zaoldyeck over 1 year ago. Updated 8 months ago. I thought it was resolved because some users didn't get the problem, but most users still permanently have to re-log, me included. After several updates of pfsense base and the radius package, nothing has improved and this is really a huge issue for me. Any help would be appreciated. My Setup: I have a captive portal with username/pw login using freeradius which also runs on the pfsense machine. Mon Jan  1 15:10:37 2018 : Warning: [/usr/local/etc/raddb/mods-config/attr_filter/access_reject]:11 Check item "FreeRADIUS-Response-Delay"     found in filter list for realm "DEFAULT". Mon Jan  1 15:10:37 2018 : Warning: [/usr/local/etc/raddb/mods-config/attr_filter/access_reject]:11 Check item "FreeRADIUS-Response-Delay-USec"     found in filter list for realm "DEFAULT". Still an issue. 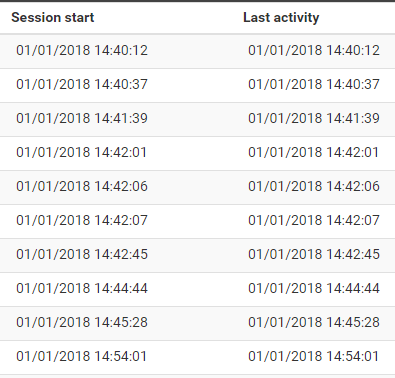 I noticed that with "Interim" accounting mode, the "Last Activity" seems to work. However simultaneous/concurrent usage limiting still doesn't. This issue is likely comming from the way pfSense and FreeRadius are talking to each other when performing accounting updates (i mean Stop/Start and Interim method). As a temporary workaround you could use an external FreeRadius server which use sql and sqlcounter modules. This issue is known since a while, but making a fix isn't trivial since it's not planed to install an SQL server on pfSense (and it will probably never be). The best way to resolve this issue would probably to make FreeRadius package use the sql module with an SQLlite database, but so far nobody has worked on a fix yet. Thanks for the reply Augustin. I'm still having this issue, perhaps I will try your idea when I upgrade the next time. Which method do I have to use with the external radius server then? At least the problem is acknowledged now..